So an Italian without polenta in their pantry, not likely! Polenta is the name given to both cornmeal and the dish made from it. This recipe is all yellow my friends, cornmeal, lemons and eggs. I was a bit skeptical about the amount of eggs in this recipe there’s eight…but in the end all turned out fine, and one single piece left for the photo and the rest is crumbs! Polenta is a major Italian staple dish. 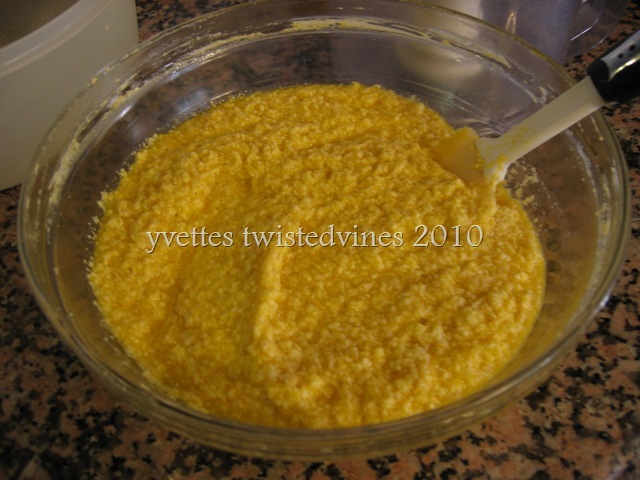 Dry polenta ( a coarsely ground cornmeal) is added to boiling salted water or stock and stirred using a wooden spoon, until it’s thick and creamy. These days a one minute wonder polenta can be purchased, so it’s cooked in a flash, otherwise the normal grounded polenta can take up to twenty minutes. Why talk about polenta, well life on the land is turning as usual and the corn crops are ready to be harvested…I thought it might be interesting to introduce you to some of the ways polenta is versatile, and apart from accompanying those Mediterranean flavours of olives and sundried tomatoes, it goes well with roasted meats, fish and vegetables, and can also be made into a variety of cakes. This recipe is definitely a sweet version, with the combination of polenta and almond meal, lemons and a citric twist of orange marmalade. Preheat oven to 160°C,grease and line a 26cm cake tin. Leave butter at room temperature before whisking with sugar until light and fluffy. Add eggs one at a time (time consuming but worth it for a creamy mixture), then add lemon zest, juice and vanilla. Add Sambuca. Fold in all dry ingredients. N.B. I couldn’t find ready made almond meal so I whizzed at high speed whole almond kernels,worked the same however an added nutty texture. Bake in oven for approximately 45 minutes or until firm in the centre. 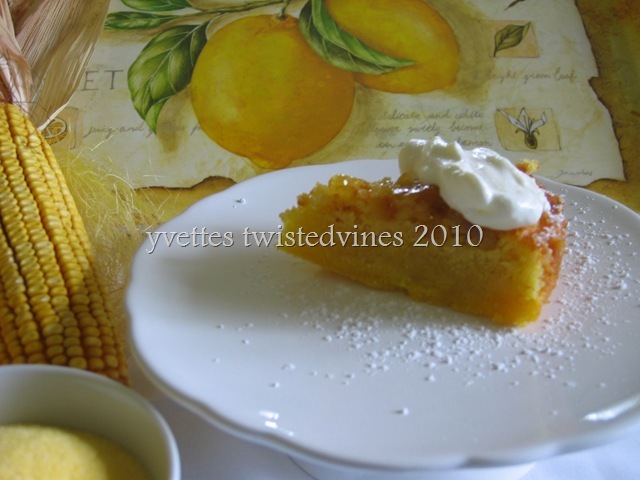 While still warm, heat 3 tablespoons of orange marmalade over a low heat until melted and brush over cake. Serve with a sprinkling of icing sugar and fresh cream. 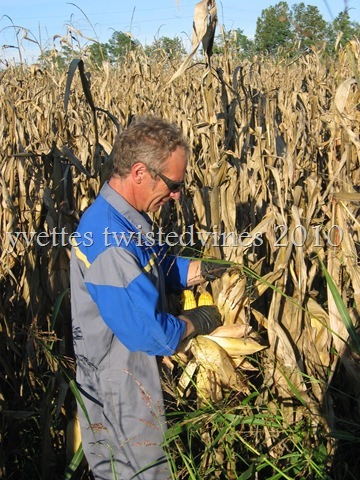 Below a photo of our corn crop…. Have a great day sharing recipes my friends. deadlines and work can put one under pressure! We must eat polenta during the autumn/winter months 2 to 3 times a week…a substitute for rice or potatoes…different however in cakes, but one to try! Thanks Tes, a very golden cake indeed.! 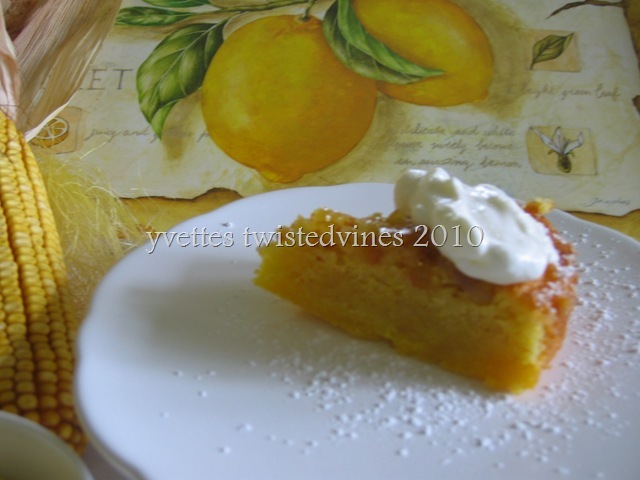 Yvette, your polenta cake looks really delicious. My grandmother used to fry sliced polenta that she bought in a tube ready to fry and serve with maple syrup. She called it fried mush. It was delicious and made a quick and easy breakfast. Obviously it was some kind of “instant” concoction. I’ve never actually cooked polenta as you described. Thank you for a great recipe. I can imagine the moist texture of this cake! 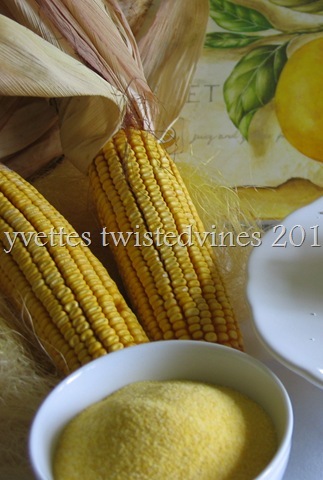 Polenta is so versified…sweet or savoury..although I’ve never eaten it for breakfast.. I must admit, it sounds kind of odd, but also fascinating. I totally wanna try it. Great pics too btw. Thanks for linkin up to tasty tuesdays. I think you’ll be surprised it you try it! IT was a winner with my guests…Always a pleasure to join your link ups! What a beautiful blog, and post, Yvette. Thanks to Amanda for directing me here. It’s a treat!! My husband LOVES polenta (and cake, for that matter). I’ll have to give this a whirl!